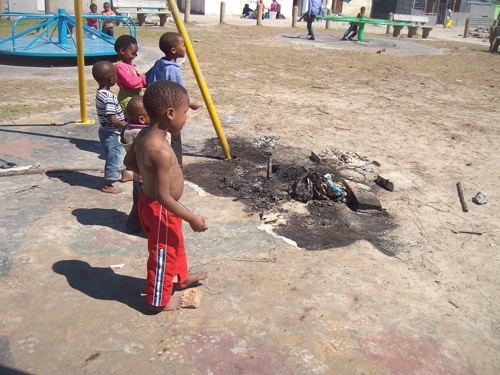 CAPE TOWN — A lack of playground facilities in Khayelitsha B-Section means children are risking their lives by crossing the busy Mandela Road in order to get to a playpark in neighbouring B-Section. Children who Workers’ World Media Productions (WWMP) spoke to in B-Section said there is no space to play in their area unless they play in the driveways and streets where they are in danger of getting hit by cars. However, going to the nearest playpark, which is about a 15-minute walk away in A-Section, means children, as young as six-years-old and unaccompanied because their parents are working, have to cross Mandela Road, which is a main thoroughfare along which taxis regularly speed. Although the park in A-Section provides space in which to run around, and basic play equipment, it is also littered with rubble and refuse, as well as being a hangout for known tik smokers. B-Section resident Nowizana Ndoyana, mother to six-year-old Sesam Ndoyana, said she was beside herself when her son recently disappeared. He had gone with some of his friends to the A-Section park without telling her. Panicked, she asked children on the street if they’d seen her son and they told her where he’d gone. When she hurried to find him, she discovered him lost and alone at the traffic circle on Mandela Road, surrounded by dangerous traffic. Parent Nokwanda Tengeni said childrens often walk off alone without telling anyone in the area because they want to play in an open space, while parents Sindiswa Mafu and Nokwanda Jamjam said it is hard to stop the children going off to play at the A-Section park because they go off on their own when their parents are busy or working, and thus a park in B-Section was needed. They said Sesam Ndoyana is not the only child who has recently been lost. Even if they get to and from the park safely, the children are exposed to drug use and other social ills when at the A-Section park as there is no supervision there. They said a nine-year-old child was recently discovered smoking tik and dagga with older children at the park. Ward councillor Mlulami Mabhuti Velem said there were “talks” about creating parks across the City of Cape Town but did not know if land for a park had been identified in B-Section. City mayco member for community services, Anda Ntsodo, said there was an Open Space Framework for Khayelitsha to determine where a park would be created, “based on priority and funding”. Ntsodo said a park was planned for D-Section in Site C during this financial year but there was “currently no zoned public open spaces in B-Section”. He said the R700 000 annual ward allocation budget was the predominant funding source in Khayelitsha and was managed by the ward councillor. As far as maintenance of the existing parks, such as the one in A-Section, they were attended to once a week. “Due to vandalism, the paving was removed and the gates stolen from the park in A-Section,” he said, adding that repairs will be done during this financial year. Subcouncil manager Johson Fetu said the only parks project for the subcouncil this year was for the upgrading of the D-Section park. Fetu said R219 730 was budgeted for this upgrade and no further projects were planned this year for the ward. There was a lack of available space for a park and no areas zoned for public open spaces.